Telangana Departmental Tests 2017 Results of May 2017, November 2016 session results: Telangana State Departmental Tests November 2016 Session Results, Telangana State Departmental Tests May 2017 Session Results, TSPSC Departmental Tests EOT GOT Special Language Results. Departmental Examinations: As per the Public Service Commission Regulations, Telangana State Public Service Commission conducts Departmental Examinations for employees working in various Departments under State Government of Telangana. The Commission conducts Departmental Examinations twice a year i.e., in May and November for the promotions to the employees. The Departmental examinations are held at thirty one (31) District Headquarters including Hyderabad. The candidates are admitted to the District Centre concerned where the candidates are presently working. Departmental Tests Paper Code and Paper Name wise Results available here. TSPSC.GOV.IN/DEPARTMENTALTEST.JSP MAY RESULTS 2017: Telangana State Public Service Commission(TSPSC) will conduct the Department tests twice a year with objective type and few tests are written exams as per its own schedule from time to time in Telangana State. Telangana State Public Service Commission, the TSPSC issued Departmental Tests TSPSC May 2017 + November 2016 session Notification no.39/2017 on 15-07-2017 for the Telangana State state employees and candidates. The TSPSC department officials invited the online applications from the eligible candidates from 18-07-2017 to 15-08-2017 through its official web portal. The eligible candidates were applied for this stream and they were appeared the departmental tests, which were conducted from 09/09/2017 to 14/09/2017as per its tests schedule. The applicants who were appeared the departmental tests they are waiting their results. TSPSC Officials will release the results and they will upload the results on its web portal. GOT 2nd Paper Code:97 was held on 11-09-2017 by 2 pm to 4 pm. Special language (Paper Code: 37) test was held on 12-09-2017 by 2 pm to 4 pm. 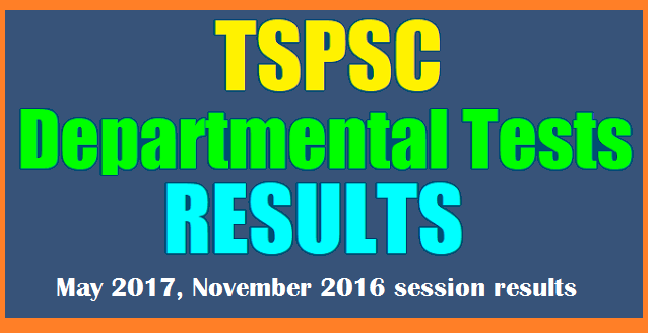 TSPSC Departmental Tests 2017 Results of May 2017, November 2016 session results: TSPSC Departmental Tests Results, TS Departmental Tests Results, Telangana State Departmental Tests Results, TSPSC Departmental Tests November 2016 Session Results, TSPSC Departmental Tests May 2017 Session Results, TS Departmental Tests November 2016 Session Results, TS Departmental Tests May 2017 Session Results, Telangana State Departmental Tests November 2016 Session Results, Telangana State Departmental Tests May 2017 Session Results, TSPSC Departmental Tests EOT GOT Special Language Results. Departmental Tests Paper Code and Paper Name wise Results. https://tspsc.gov.in/TSPSCWEB0508/departmentalTest.jsp Results, https://tspsc.gov.in/TSPSCWEB0508/Results3917depttest.jsp. 2. 84-93-105-123 LOCAL FUND AUDIT DEPARTMENT TEST PAPER - I (WITH BOOKS) HELD ON 11/09/2017 AFTER NOON. 3. 137-142 ACCOUNTS TEST FOR P.W.D. OFFICERS AND SUBORDINATES. 4. 141 THE ACCOUNTS TEST FOR EXECUTIVE OFFICERS. 5. 146-148 THE ACCOUNTS TEST FOR THE EMPLOYEES OF LOCAL BODIES. 6. 1-9-23-34-53 SUBORDINATE ACCOUNTS SERVICE EXAMINATION . 7. 3-13-21-35-54-71 EXCISE DEPARTMENT TEST . 8. 31-64-89-114-46-79-100-129 TREASURIES & ACCOUNTS SERVICE EXAMINATION PART - I : PAPER - I (WITH BOOKS) HELD ON 09/09/2017 AFTER NOO N.
9. 41-59.pdf D.T. FOR CHIEF AND DEPUTY CHIEF ACCOUNTANTS IN THE ELECTRICITY DEPARTMENT . 10. 051.pdf ANIMAL HUSBANDRY DEPARTMENT TEST. 14. 151 MARKETING DEPARTMENT TEST. 15. 2-12-20 DEPUTY INSPECTOR'S TEST. 16. 004. D.T. FOR CLERKS IN THE POLICE DEPARTMENT. 17. 32-65-90-115-47-80-101-130-143. D.T. FOR EMPLOYEES OF SERICULTURE DEPARTMENT PART -I : PAPER - I (WITHOUT BOOKS) HELD ON 12/09/2017 AFTER NOON. 18. 045. THE CIVIL JUDICIAL TEST PART - I . 22. 145-147. THE CIVIL JUDICIAL TEST PART - II. 23. 077 INDIAN EVIDENCE ACT TEST. 24. 16-25-39. FIRE SERVICE DEPARTMENT TEST. 25. 19-28. FIRE SERVICE DEPARTMENT TEST. 26. 22-40-57-75. LABOUR, FACTORIES AND BOILERS DEPARTMENT TEST. 27. 33-48-66-82. JAIL DEPARTMENT TEST. 28. 132. D.T. FOR OFFICERS AND MINISTERIAL STAFF OF THE STATIONERY, PRINTING AND STORES PURCHASE DEPARTMENT. 29. 005.. SECOND CLASS LANGUAGE TEST: PART-A. 30. 008. ACCOUNTS TEST FOR SUBORDINATE OFFICERS PART - I. 31. 014-029. ACCOUNTS TEST FOR PUBLIC WORKS. 32. 15-24-56-85. FISHERIES DEPARTMENT TEST -II. 33. 36-49-67.pdf. SPECIAL LANGUAGE TEST FOR OFFICERS OF THE EDUCATION. 34. 37. SPECIAL LANGUAGE TEST FOR OFFICERS OF EDUCATION DEPARTMENT - HIGHER STANDARD. 35. 50. D.T. FOR OFFICERS OF THE T.S. AGRICULTURAL SERVICE. 37. 060-068. D.T. FOR EMPLOYEES OF T.S.G.L.I. 38. 69-87. REVENUE DRAUGHTSMAN'S TEST. 39. 095.pdf. FISHERIES DEPARTMENT TEST - I. 40. 96-104.. D.T. FOR STAFF OF NATIONAL EMPLOYMENT SERVIC. 41. 149. D.T. FOR THE GAZETTED AND NON-GAZITTED STAFF OF THE T.S. PUBLIC SERVICE COMMISSION. 42. 150. D.T. FOR MINES AND GEOLOGY. 43. 152. D.T. FOR TECHNICAL STAFF OF ELECTRICAL INSPECTORATE SERVICE. 44. 156-157-158-159. JUVENILE WELFARE CORRECTIONAL SERVICES AND WELFARE OF STREET CHILDREN DEPARTMENT TEST. 45. 44-78-99-128. D.T. FOR T.S. WORKS ACCOUNTS SERVICE PART - I. 46. 109-118. SURVEYORS' TEST (HIGHER GRADE). 47. 110-119. SURVEY & SETTLEMENT SURVEYORS' TEST (HIGHER GRADE). 48. 111-120. SURVEYORS' TEST (LOWER GRADE). 49. 112-121. SURVEY & SETTLEMENT SURVEYORS' TEST (LOWER GRADE) . 50. 117-134. SURVEY & SETTLEMENT INSPECTOR'S TEST. 51. 122-135. COMPUTATION TEST . 52. 006.. EXAMINATION IN GUJARATHI LANGUAGE . 53. 007. EXAMINATION IN MARWARI LANGUAGE : PART - A . 54. 116-133. Survey Inspector’s Test. 55. 131. D.T. FOR GOVERNMENT PRESS OFFICERS. 56. 153. ACCOUNTS TEST FOR SUBORDINATE OFFICERS PART-II. 57. 17-26-42-61-76-86. D. T. FOR NON-TECH. STAFF IN THE T.S. ELECTRICAL INSPECTORATE. 59. 52-70-83-94. REGISTRATION DEPARTMENT TEST. 60. 88-97. D.T. FOR GAZETTED OFFICERS OF EDUCATION DEPARTMENT. 61. 98-108-127-136. CRIMINAL JUDICIAL TEST. 62. 103-126. ENDOWMENTS DEPARTMENT TEST.